Cookin’ up a new record. Download “Laying Me Low” from David Cook on iTunes. / Listen to “Laying Me Low”. Remember this guy? Singer-songwriter David Cook took to the American Idol stage nearly five years ago and won the competition in a close match with David Archuleta. He ranked a few hits on the charts from his debut self-titled album, including “Light On” and “The Time Of My Life”, both of which hit #1 on my personal chart. The effort was certified Platinum for shipments of over 1 million copies. His second album for RCA Records, This Loud Morning, didn’t do nearly as well, with a lack of radio support for the album’s two singles, which only charted on the Hot AC survey. Cook was subsequently dropped from the label due to low sales. However, Cook has returned with this single for XIX Records entitled “Laying Me Low”. It comes from a forthcoming third solo album for the singer, and it’s a return to great form for him. It combines Cook’s signature pop/rock sound with a more haunting melody, which seems to work with this song about a girl who tempts our male protagonist, but he keeps playing along despite all the warnings. I think it’s a winner; how about you? Check out the lyrics below and download the song above! Here’s hoping this song gets better support from the radio gurus! This is a great song and really deserves to do well and bring David Cook back into the public eye. Love it. Total ear candy! yep, progression. no wonder I am still following this dude. His voice, the lyrics, the tempo, the melody….well, everything on this single deserves 2 thumbs up, way up!! . I am a fan for life ’cause David Cook is the real deal. It sure is worth the wait for David! He is awesome…what a great song this is and I cannot wait to see him sing this live on Thursday! Ditto. 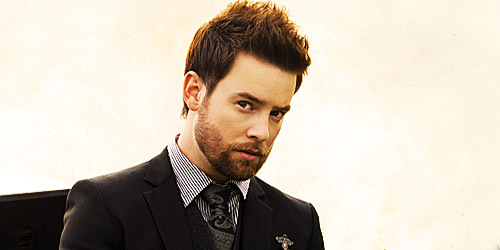 David Cook has written a fun song about being smitten. A little pain, a lot of irony, and great energy. Stomp. Clap. Stomp. Clap. ..
Catchy song with great lyrics and equally great vocals. Makes you want to move and sing along. Can’t wait to see him perform this on American Idol tonight. What a great song!! Yea David you did it again. I hope the radio Gods play the crap out of this song. You deserve it! David Cook is BACK! Laying Me Low is still running around in my head! Very catchy tune. Love Dave’s voice on this! This WILL be a hit! Buy it! I love Laying Me Low! This song needs to be on the radio! May be my favorite single yet!